For the surname, see Gilding (surname). Gilding is any decorative technique for applying a very thin coating of gold to solid surfaces such as metal (most common), wood, porcelain, or stone. A gilded object is also described as "gilt". Where metal is gilded, it was traditionally silver in the West, to make silver-gilt (or vermeil) objects, but gilt-bronze is commonly used in China, and also called ormolu if it is Western. Methods of gilding include hand application and gluing, typically of gold leaf, chemical gilding, and electroplating, the last also called gold plating. Parcel-gilt (partial gilt) objects are only gilded over part of their surfaces. This may mean that all of the inside, and none of the outside, of a chalice or similar vessel is gilded, or that patterns or images are made up by using a combination of gilt and ungilted areas. Gilding gives an object a gold appearance at a fraction of the cost of creating a solid gold object. In addition, a solid gold piece would often be too soft or too heavy for practical use. A gilt surface also does not tarnish as silver does. Herodotus mentions that the Egyptians gilded wood and metals, and many such objects have been excavated. Certain Ancient Greek statues of great prestige were chryselephantine, i.e., made of gold (for the clothing) and ivory (for the flesh); these however, were constructed with sheets of gold over a timber framework, not gilded. Extensive ornamental gilding was also used in the ceiling coffers of the Propylaea. Pliny the Elder informs us that the first gilding seen at Rome was after the destruction of Carthage, under the censorship of Lucius Mummius, when the Romans began to gild the ceilings of their temples and palaces, the Capitol being the first place on which this process was used. But he adds that luxury advanced on them so rapidly that in very little time you might see all, even private and poor people, gild the walls, vaults, and other parts of their dwellings. Owing to the comparative thickness of the gold leaf used in ancient gilding, the traces of it that remain are remarkably brilliant and solid. Fire-gilding of metal goes back at least to the 4th century BC, and was known to Pliny (33,20,64–5), Vitruvius (8,8,4) and in the Early Mediaeval period to Theophilus (De Diversis Artibus Book III). In Europe, silver-gilt has always been more common than gilt-bronze, but in China the opposite has been the case. The ancient Chinese also developed the gilding of porcelain, which was later taken up by the French and other European potters. Modern gilding is applied to numerous and diverse surfaces and by various processes; those used in modern technology are described in gold plating. More traditional techniques still form an important part of framemaking and are sometimes still employed in general woodworking, cabinet-work, decorative painting and interior decoration, bookbinding, and ornamental leather work, and in the decoration of pottery, porcelain, and glass. Mechanical gilding includes all the operations in which gold leaf is prepared, and the processes to mechanically attach the gold onto surfaces. The techniques include burnishing, water gilding and oil-gilding used by wood carvers and gilders; and the gilding operations of the house decorator, sign painter, bookbinder, the paper stainer and several others. "Overlaying" or folding or hammering on gold foil or gold leaf is the simplest and most ancient method, and is mentioned in Homer's Odyssey (Bk vi, 232) and the Old Testament. The Ram in a Thicket of about 2600–2400 BCE from Ur uses this technique on wood, with a thin layer of bitumen underneath to help adhesion. The next advances involved two simple processes. The first involves gold leaf, which is gold that is hammered or cut into very thin sheets. Gold leaf is often thinner than standard paper today, and when held to the light is semi-transparent. In ancient times it was typically about ten times thicker than today, and perhaps half that in the Middle Ages. If gilding on canvas or on wood, the surface was often first coated with gesso. "Gesso" is a substance made of finely ground gypsum or chalk mixed with glue. Once the coating of gesso had been applied, allowed to dry, and smoothed, it was re-wet with a sizing made of rabbit-skin glue and water ("water gilding", which allows the surface to be subsequently burnished to a mirror-like finish) or boiled linseed oil mixed with litharge ("oil gilding", which does not) and the gold leaf was layered on using a gilder's tip and left to dry before being burnished with a piece of polished agate. Those gilding on canvas and parchment also sometimes employed stiffly-beaten egg whites ("glair"), gum, and/or Armenian bole as sizing, though egg whites and gum both become brittle over time, causing the gold leaf to crack and detach, and so honey was sometimes added to make them more flexible. Other gilding processes involved using the gold as pigment in paint: the artist ground the gold into a fine powder and mixed it with a binder such as gum arabic. The resulting gold paint, called shell gold, was applied in the same way as with any paint. Sometimes, after either gold-leafing or gold-painting, the artist would heat the piece enough to melt the gold slightly, ensuring an even coat. These techniques remained the only alternatives for materials like wood, leather, the vellum pages of illuminated manuscripts, and gilt-edged stock. In this process the gold is obtained in a state of extremely fine division, and applied by mechanical means. Cold gilding on silver is performed by a solution of gold in aqua regia, applied by dipping a linen rag into the solution, burning it, and rubbing the black and heavy ashes on the silver with the finger or a piece of leather or cork. Wet gilding is effected by means of a dilute solution of gold(III) chloride in aqua regia with twice its quantity of ether. The liquids are agitated and allowed to rest, to allow the ether to separate and float on the surface of the acid. The whole mixture is then poured into a separating funnel with a small aperture, and allowed to rest for some time, when the acid is run off from below and the gold dissolved in ether separated. The ether will be found to have taken up all the gold from the acid, and may be used for gilding iron or steel, for which purpose the metal is polished with fine emery and spirits of wine. The ether is then applied with a small brush, and as it evaporates it deposits the gold, which can now be heated and polished. For small delicate figures, a pen or a fine brush may be used for laying on the ether solution. The gold(III) chloride can also be dissolved in water in electroless plating wherein the gold is slowly reduced out of solution onto the surface to be gilded. When this technique is used on the second surface of glass and backed with silver, it is known as "Angel gilding". Fire-gilding or Wash-gilding is a process by which an amalgam of gold is applied to metallic surfaces, the mercury being subsequently volatilized, leaving a film of gold or an amalgam containing 13 to 16% mercury. In the preparation of the amalgam, the gold must first be reduced to thin plates or grains, which are heated red-hot, and thrown into previously heated mercury, until it begins to smoke. When the mixture is stirred with an iron rod, the gold is totally absorbed. The proportion of mercury to gold is generally six or eight to one. When the amalgam is cold, it is squeezed through chamois leather to separate the superfluous mercury; the gold, with about twice its weight of mercury, remains behind, forming a yellowish silvery mass with the consistency of butter. When the metal to be gilded is wrought or chased, it ought to be covered with mercury before the amalgam is applied, that this may be more easily spread; but when the surface of the metal is plain, the amalgam may be applied to it directly. 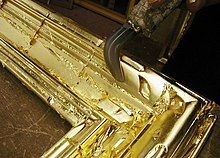 When no such preparation is applied, the surface to be gilded is simply bitten and cleaned with nitric acid. A deposit of mercury is obtained on a metallic surface by means of quicksilver water, a solution of mercury(II) nitrate, the nitric acid attacking the metal to which it is applied, and thus leaving a film of free metallic mercury. The amalgam being equally spread over the prepared surface of the metal, the mercury is then sublimed by a heat just sufficient for that purpose; for, if it is too great, part of the gold may be driven off, or it may run together and leave some of the surface of the metal bare. When the mercury has evaporated, which is known by the surface having entirely become of a dull yellow color, the metal must undergo other operations, by which the fine gold color is given to it. First, the gilded surface is rubbed with a scratch brush of brass wire, until its surface is smooth. It is then covered with gilding wax, and again exposed to fire until the wax is burnt off. Gilding wax is composed of beeswax mixed with some of the following substances: red ochre, verdigris, copper scales, alum, vitriol, and borax. By this operation the color of the gilding is heightened, and the effect seems to be produced by a perfect dissipation of some mercury remaining after the former operation. The gilt surface is then covered over with potassium nitrate, alum or other salts, ground together, and mixed into a paste with water or weak ammonia. The piece of metal thus covered is exposed to heat, and then quenched in water. By this method, its color is further improved and brought nearer to that of gold, probably by removing any particles of copper that may have been on the gilt surface. This process, when skillfully carried out, produces gilding of great solidity and beauty, but owing to the exposure of the workmen to mercurial fumes, it is very unhealthy. There is also much loss of mercury to the atmosphere, which brings extremely serious environmental concerns as well. This method of gilding metallic objects was formerly widespread, but fell into disuse as the dangers of mercury toxicity became known. Since fire-gilding requires that the mercury be volatilized to drive off the mercury and leave the gold behind on the surface, it is extremely dangerous. Breathing the fumes generated by this process can quickly result in serious health problems, such as neurological damage and endocrine disorders, since inhalation is a very efficient route for mercuric compounds to enter the body. This process has generally been supplanted by the electroplating of gold over a nickel substrate, which is more economical and less dangerous. In depletion gilding, a subtractive process discovered in Pre-columbian Mesoamerica, articles are fabricated by various techniques from an alloy of copper and gold, named tumbaga by the Spaniards. The surface is etched with acids, resulting in a surface of porous gold. The porous surface is then burnished down, resulting in a shiny gold surface. The results fooled the conquistadors into thinking they had massive quantities of pure gold. The results startled modern archaeologists, because at first the pieces resemble electroplated articles. Keum-boo is a special Korean technique of silver-gilding, using depletion gilding. Buddha, 16th Century, gilt on wood. The Walters Art Museum. The gilding of decorative ceramics has been undertaken for centuries, with the permanence and brightness of gold appealing to designers. Both porcelain and earthenware are commonly decorated with gold, and in the late 1970s it was reported that 5 tonnes of gold were used annually for the decoration of these products. Some wall tiles also have gold decoration. Application techniques include spraying, brushing, banding machines, and direct or indirect screen-printing. After application the decorated ware is fired in a kiln to fuse the gold to the glaze and hence ensure its permanence. The most important factors affecting coating quality are the composition of applied gold, the state of the surface before application, the thickness of the layer and the firing conditions. Acid-etched gilding – developed in 1860s at Mintons, Stoke-on-Trent, and patented in 1863. The glazed surface, usually a narrow border, is transfer printed with a wax-like resist, after which the glaze is etched with dilute hydrofluoric acid prior to application of the gold, after which the design's raised elements are selectively burnished to give a bright and matte surface; the process demands great skill and is used for the decoration only of ware of the highest class. Bright Gold or Liquid Gold is a solution of gold sulphoresinate together with other metal resinates and a bismuth-based flux. It is particularly bright when drawn from the decorating kiln and so needs little further processing. This form of gilding was invented or at least improved by Heinrich Roessler. Rhodium compounds are used to improve the binding to the substrate. Burnish Gold or Best Gold is applied to the ware as a suspension of gold powder in essential oils mixed with lead borosilicate or a bismuth-based flux. This type of gold decoration is dull as taken from the kiln and requires burnishing, usually with agate, to bring out the colour. As the name suggests it is considered the highest quality of gold decoration. One solvent-free burnish gold composition was reported to consist of 10 to 40% gold powder, 2 to 20% polyvinylpyrrolidone, 3 to 30% an aqueous acrylate resin and 5 to 50% water. ^ "Buddha". The Walters Art Museum. ^ Hunt, L. B. (1979). "Gold in the pottery industry". Gold Bulletin. 12 (3): 116. doi:10.1007/BF03215112. ^ Etris, S.F. (1982). "Gold And Lustres For The Ceramic Tile Industry". Ceramic Industries. 119 (5): 36. ^ Abt, K. (2008). "Comeback Of Gold Decoration? Trends And New Materials For Tile Decoration". Keram. Z. 60 (1). ^ Groh, E. (1995). "Precious Metal Preparations: Composition, Applications And Special Decorative Effects". Ceramic Forum International. 72 (3). ^ Gerasimova, L. V.; Ivanova, V. M.; Peskova, E. Yu. ; Druzhinin, E. V. (1991). "Improving gold decorating techniques". Glass and Ceramics. 48 (11): 535. doi:10.1007/BF00676649. ^ Dodd, A.and Murfin, D. (1994) Dictionary Of Ceramics. The Institute Of Minerals. ^ Rovinskaya, N. V.; Lapitskaya, E. V. (1998). "Liquid gold and other components used in decoration of glazed porcelain and glass articles". Glass and Ceramics. 55 (3–4): 98. doi:10.1007/BF03180905. ^ Helena Hayward (ed.) (1960) The Connoisseur’s Handbook of Antique Collecting. Galahad Books, NY. ^ "Burnish Gold Decorating Composition." UK Pat.Appl.GB2216536 A, for Heraeus W.C., Gmbh. This article incorporates text from a publication now in the public domain: Chisholm, Hugh, ed. (1911). "Gilding" . Encyclopædia Britannica. 11 (11th ed.). Cambridge University Press. pp. 13–14. Carboni, Stefano; Whitehouse, David (2001). Glass of the sultans. New York: The Metropolitan Museum of Art. ISBN 0870999869. Look up gilding in Wiktionary, the free dictionary.